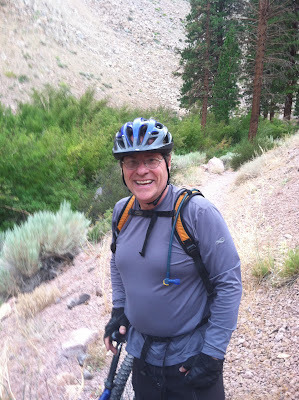 We stopped on the doorstep of Mammoth Lakes and rode/shuttled the Lower Rock Creek trail. 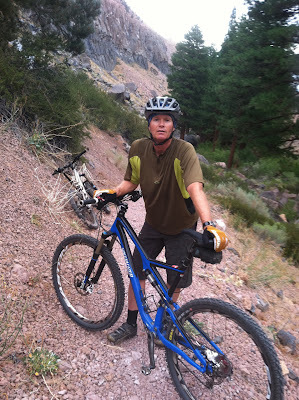 8 miles of downhill trail creekside in Aspens and such. Pretty sweet. 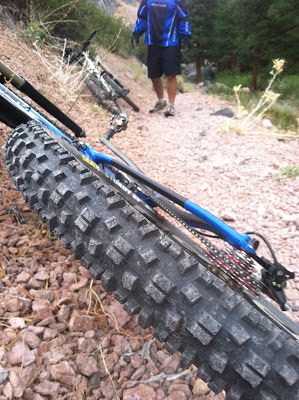 This trip I brought the FSR 5 incher with some new tires that I hoped would float over the pumice of Mammoth (old volcano, 'ya know). So, it begins. Time to pedal and go "wheeeee!". Phil, the mad scientist organizer of the trip. 2.3 inches of crazy 29er rubber. Geax Sturdy. Old guy looking somewhat stunned and less than intelligent. Pretty much normal for me.